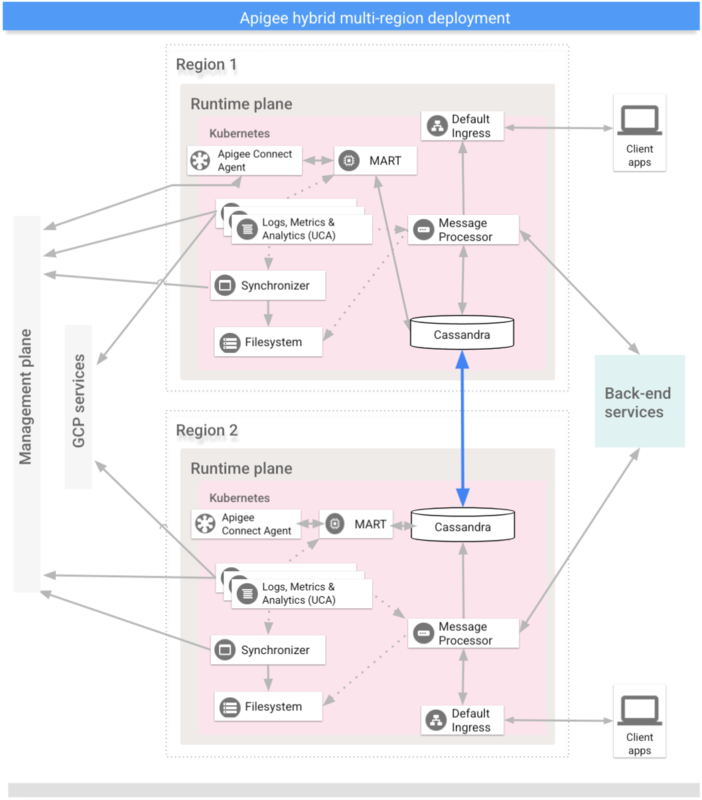 This topic describes a multi-region deployment for Apigee hybrid. Active-Active: If you have applications deployed in multiple geographic locations and want to have low latency API response for your deployments. You have the option to deploy hybrid in multiple geographic locations nearest to your clients. For example: US West Coast, US East Coast, Europe, APAC. Before configuring hybrid for multi region, you must complete these prerequisites. Refer to the Kubernetes documentation for details. Kubernetes clusters in multiple regions must be set up with different CIDR blocks. Cross-region communication must be set up. Cassandra ports 7000 and 7001 between Kubernetes clusters between all regions should be whitelisted. This section describes how to expand the existing Cassandra cluster to a new region. This setup allows the new region to bootstrap the cluster and join the existing data center. Without this configuration, the multi region Kubernetes clusters would not know about each other. Run the following command to identify a seed host address for Cassandra in the current region. A seed host address allows a new regional instance to find the original cluster on the very first startup to learn the topology of the cluster. The seed host address is designated as the contact point in the cluster. Decide which of the IPs returned from the previous command will be the multi-region seed host. In the new data center/region, before you install hybrid, set the same TLS certificates and credentials in overrides.yaml as you set in the first region. NOTE: Be sure to use the same Cassandra TLS certificates and credentials in the second data center as you provided in the original data center. The credentials you set in overrides.yaml in the first data center must match the ones you specify in overrides.yaml in the second data center. For details see Configuring TLS for Cassandra. After you configure the seed host, you can set up the new region. Install hybrid in the new region. Be sure that the overrides-DC_name.yaml file includes the same TLS certificates that are configured in the first region, as explained in the previous section. For more information, see Installation overview. NOTE: If you don't see a command prompt, try pressing the enter key. Connected to apigeecluster at apigee-cassandra-0.apigee-cassandra.apigee.svc.cluster.local:9042. Run nodetool rebuild sequentially on all the nodes in new data center. This may take a few minutes to a few hours depending on the data size. Update the seed hosts. Remove multiRegionSeedHost: 10.0.0.11 from overrides-DC_name.yaml and reapply. Seed hosts are local cluster members. To boot up a new region an external seed host is required. Once a region boots up you need to change the seed hosts back to their local clusters in overrides.yaml and then reapply the configuration.